Referring to the unofficial twinnings that reflect Berlin’s current immigrant population instead of the official equivalents of the city, the project explores the city’s long tradition of urban horticulture and reveals ideas of health in the widest sense: as balance and imbalance as well as on a societal and personal level, looking at how people navigate and share resources within a city. 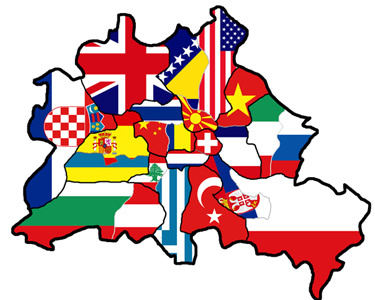 At present the largest groups of foreign nationals in Berlin are those from Turkey, Poland, Serbia, Italy, Russia, France, Vietnam, the US, Bosnia and Herzegovina, the UK, Croatia, Bulgaria, Austria, Greece, Ukraine as well as a large Arab community, mostly from Palestine and Iraq. Starting from the specificity of the city's allotment system and looking at the more unseen connections and 'energy lines’, the project focused on the unofficial twinnings, the countries and cities with which Berlin maintains a close relationship yet which prefers to be less visible. It was initially intended to develop an area of land where immigrants of different nationalities, representing the percentages of immigration in Berlin, could cultivate their own foodstuff. The project approached Landesverband Berlin der Gartenfreunde, the organization responsible for allocating allotments, to rent a plot of land where this mixed group of people would be able to cultivate together, to share their resources and knowledge and also learn about what’s known as the Kleingartenanlage (KGA) community garden plots, by interacting with German plot holders. The Landesverband Berlin der Gartenfreunde was not willing to rent out a plot for the project, and what became interesting was the way in which the attempts to be involved with the official KGA mirrored the way in which many immigrants remain unable to access more official places of support or institutions in Berlin. By working with the immigrants in their own homes and in the community gardens where they have been allowed to cultivate, the project began to document the plants, herbs and vegetables that they grow, to record recipes, and to explore the relationships between what they cultivate and their ideas of health in their respective cultures. Stories, myths and tales relating to the experiences of the participants coming to and living in Berlin were also recorded. At the same time, the project continued to work with both German holders from Landesverband Berlin der Gartenfreunde and plot holders from intercultural gardens to explore their ideas of allocating land, sharing resources, and the plants, food and herbs that they cultivate for health. Indeed, according to the World Health Organization, “health is a state of complete physical, mental and social well-being, and not merely the absence of disease or infirmity”. Well-being is now acknowledged as being connected to ways of living, relationships, social connections and interactions, allowing for a private microcosm and space, a place of comfort and security in the face of global macrocosms. Invisible Twinning explores these wider notions of health in connection with urban horticulture as a means of connecting with other places and countries and linking people from different nationalities through gardening. Afterall, as Wendell Berry said, “the earth is what we all have in common." However, even if Berlin is one of the most multicultural cities in the world, from the project’s experience, deeper intercultural exchanges seem to happen rarely. This can be seen in the need to have different types of gardens within the same city. There is a difference in Berlin between official allotment gardens governed by the Federal Allotment Gardens Act which are mostly taken by German people, and the community or intercultural gardens often cultivated by people coming from different countries. These worlds do not often meet. The process, meetings, interviews, exchanges, conversations and research - the replies the project received from official organizations; the people the group met; the gardens the group visited; the office to which the group applied for land; the recipes recorded; the cultivations techniques shared - are all part of this project. 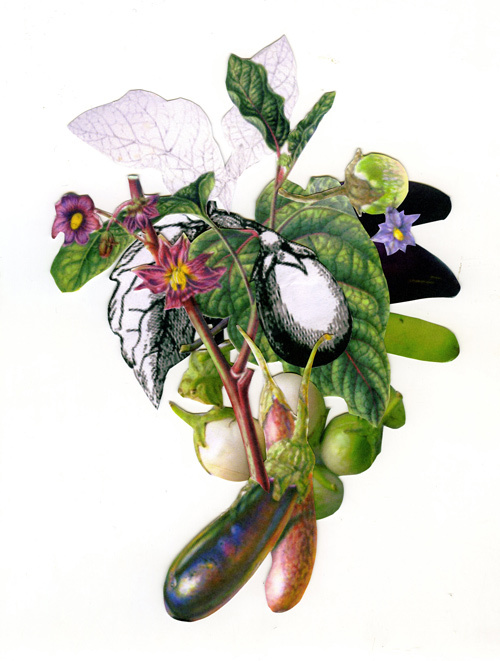 The documentation of this process and experience has been constantly updated in a dedicated blog and is brought together as a limited-edition publication, featuring collages of the ingredients and how they are represented and portrayed in different cultures and times. The project culminates in a celebratory meal, which alludes to, yet alters the format of official state banquets - an official/unofficial meal, celebrating and highlighting the countries and communities more closely twinned with or connected to Berlin and Germany than acknowledged. These invisible twinnings have been made visible through the artists’ Gayle Chong Kwan and Giulia Giannola's exploration and documentation of the experiences and memories of the people from the largest groups of foreign nationalities in Berlin through cultivation, food, recipes and ingredients. Chong Kwan’s works create mise-en-scène landscapes and environments out of disturbing arrangements of waste, food, found materials and documentary sources, and highlight the ambiguous relationship between reality, appropriation, and the detoured implications of fictional contemporary mechanisms, collective histories and latter day myths. Giulia Giannola often uses performance and video as her preferred tools to investigate the idea of time as a fundamental point in our society, within commercial exchanges, contemporary behaviour and human relationships. In the seasonal passage and cycle of cultivation and agriculture, one can find the time and space to listen to oneself as well as finding communality with others. Connections can be made through growing techniques, ingredients and recipes, between past and future possibilities, between people and cultures, and as moments in different journeys. Like the roots and tubers which connect plants and vegetables underground, the usually unseen connections can be made more visible, acknowledging the actual twinnings between Berlin and other places. This article appeared in Meridian | Urban. Curatorial Projects on Health in the framework of the Asia-Pacific Weeks Berlin 2011. Francesca Mila Nemni, Curator of the project Invisible Twinning. It is reprinted here, with permission.